We invite you to join us at C:ADM2010 and its associated events. To join C:ADM2010 (and, through C:ADM2010, to apply to join all the associated events) you will need to fill in the statement of interest form. Please note that not all associated events are open to everyone attending C:ADM2010. You have already set up your profile. This allows you (and, apart from the web master, only you) to access your statement of interest at any time you wish, until submission is closed. So you may work on your submission as you like to. We have changed the way in which profiles for new applicants/participants are set up. 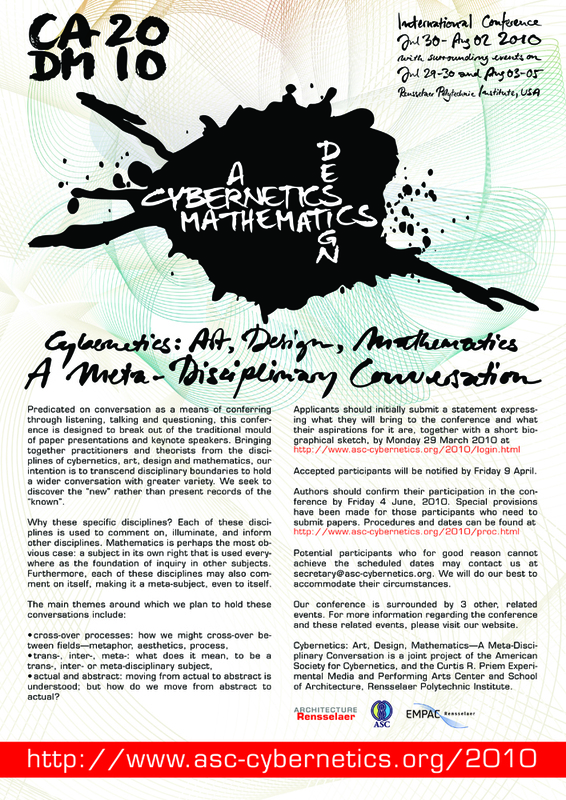 If you wish to join C:ADM2010 and have your profile set up so you can submit your Statement of Interest, please contact secretary@asc-cybernetics.org via email. You will then receive a reply with your login ID and password. Eventually, those who have set up their profiles and whose statements of interest have been accepted will form the conference community. If you are applying after 19-Apr-2010, you should contact the web master at secretary@asc-cybernetics.org. We will be as accommodating as possible, but you will understand that it helps us plan when we have some idea of the interest. Your statement of interest helps us learn about who wishes to come to C:ADM2010 and both what the offer the conference and what they are looking for from the conference. Your main statement should be no more than 2500 keystrokes (about 400 words) and should be made in English. We also ask for a brief biography and photo, and contact details etc. This material will form the basis of the conference handbook. The organizing committee will review all statements of interest and will get back to proposers in due course. You do not need to pay the conference fee in order to submit your statement of interest. The range of fees, and the early bird arrangements can be found here. When you want to pay, you can do so through our automated conference payment system on ACTEVA as described here.